Signed, lined and dated UK first edition. Synopsis : His nephew has been kidnapped and, as he works desperately to save Luke, Detective Inspector Cass Jones has been framed for murder. He's on the run, being hunted by former colleagues, and is unwelcome wherever he goes ...until he gets help from a very unexpected figure from his past. Detectives Hask and Ramsey are on a different case - searching for the killer behind the lethal Strain II virus currently sweeping its way through London ...a search which throws up an unexpected clue that suggests Cass might be innocent of murder after all. But when they're ordered not to investigate further, they realise the mystery behind the murder is far greater than they thought. Somehow it's linked to Mr Bright, and to the Network which manipulates everyone from the shadows. A rift is growing between these rival factions as Strain II takes a firmer hold on the city, and as the Interventionists warn of a final battle which will bring them all together - or, once and for all, tear everything apart. Cass Jones is going up against The Bank and its sinister employees one last time. He needs every ally he can get, and this time he means to find answers - even if he has to uncover the true history of humanity to do it. 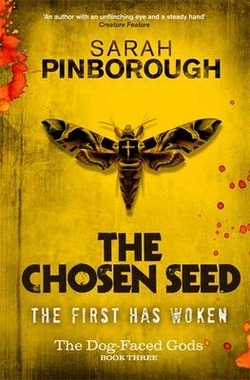 And the more he learns, the more everything hinges on finding Luke ...Set in a future that's close enough to touch, Sarah Pinborough's series combines the streetwise grime of a George Pelecanos mystery with the near-future dystopian setting of Richard Morgan.